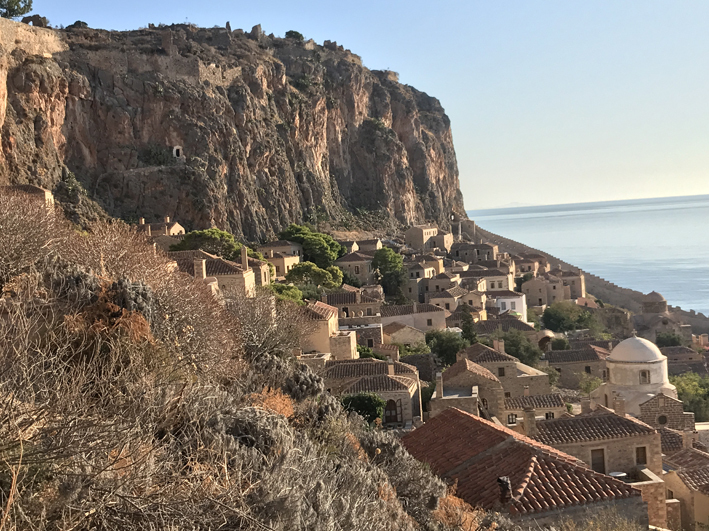 We used the attractive seaside town of Nafplio (three fine fortresses and a centre with Venetian influences) as a base to explore some of the oldest stuff in the Peloponnese. 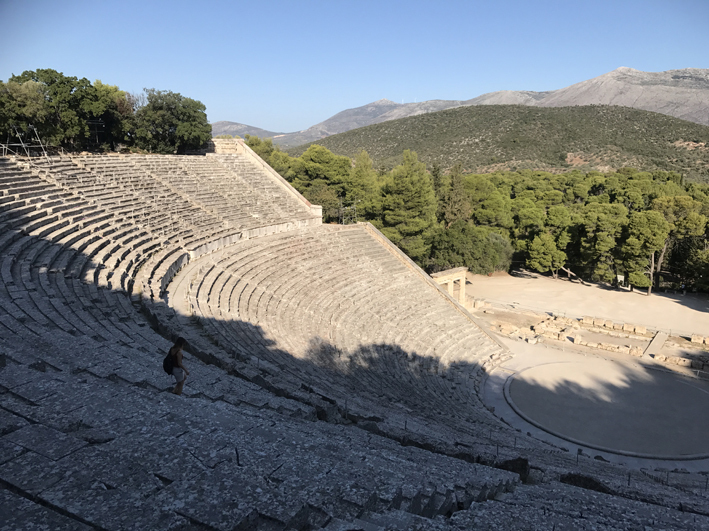 First Mycenae (see previous blog) and then Epidavros, where there is an astonishingly large and complete 14,000-seater Classical Greek amphitheatre. Of course. On the same site there is also a "sanctuary", a sort of ancient-times health spa dedicated to Asclepius, the God of medicine. In its day there was a bathhouse, a gymnasium and a dining hall - eating and exercise being seen as beneficial to health then, as now. 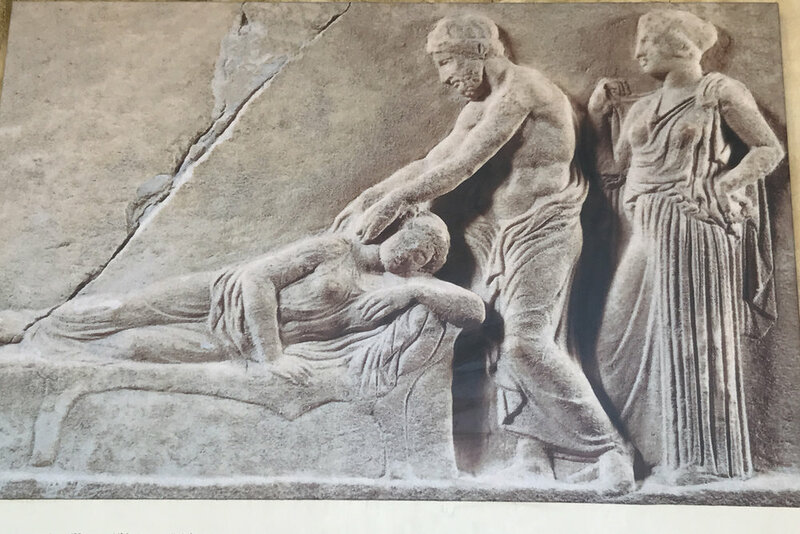 But a big part of the treatment at Epidavros involved patients being put to sleep in a sacred space called an Abaton, where they hoped to be visited (and cured) by Asclepius. Carved stele and stone tablets from the 4th century BC describe many miraculous cures. Advertising isn't just a modern invention. "She slept in the Abaton and saw a dream. It seemed to her a handsome boy lifted up her dress, and after that the god touched her belly with his hand." The woman apparently later gave birth to a son. How much the handsome boy played a part in that isn't revealed. If dream therapy didn't work, an alternative treatment involved snake bites/licks. Snakes were equated with rejuvenation, because they shed their skin and come out good as new. Kill or cure, perhaps. So many random stones. Like the hardest jigsaw ever, plus pirates having run off with some of the critical pieces. There's still masses of excavation and restoration work going on at Epidavros. I've always thought of archaeology as rather a romantic, glamorous profession. Searching for (nay, finding!) hidden cities in the jungle, or on Greek hillsides. Epidavros relieved me of that misconception. In one area of the site a young woman with a scalpel scratched endlessly away at black lichen on a white pillar. It was painfully slow work and the line of fragments needing her attention stretched away under the trees. 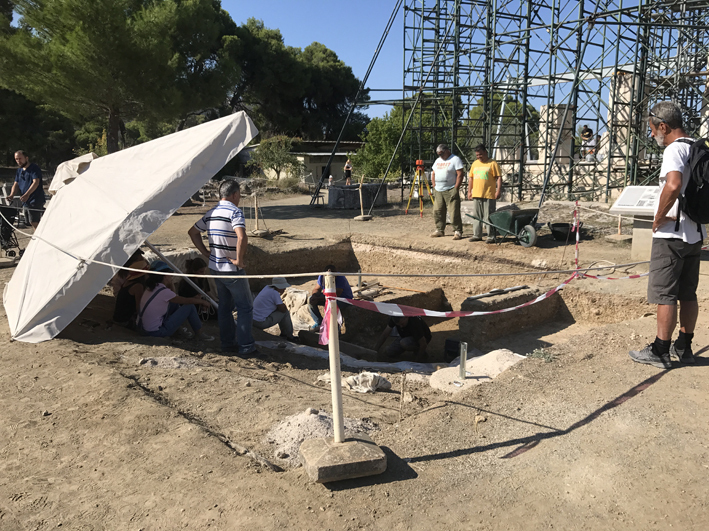 In another part of the site, an archaeologist in a small pit scraped away at the earth with a trowel and a brush, watched by hot, bored-looking Italian students and their teacher sitting under an umbrella. Two burly Greek guys with a wheelbarrow, and a New Zealand tourist also peered in from the edges. Meanwhile, outside the restoration sheds men were modelling complete pillars from much smaller fragments. One guy with a sander did at least wear boots, ear protection and glasses. His mate, standing next to him with a mallet had no such protection. Neither wore masks. Even if they don't get the fatal lung disease silicosis from prolonged exposure to dust, it was very hot and I was not at all envious. But until I read the signboards about the Sanctuary, I hadn't really grasped that an archaeologist's work isn't just repetitive and dangerous, it's also plain impossible. 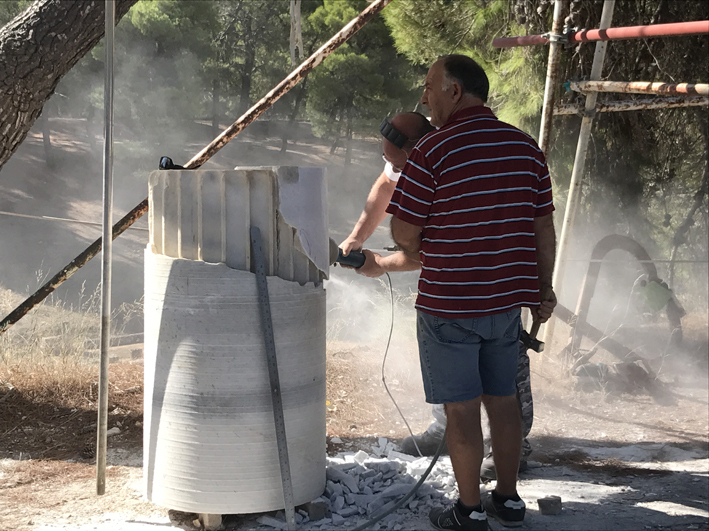 At Epidavros, for example, they aren't just trying to decipher what the Greeks used the various ruined buildings for around 300BC, but are trying to separate those Classical Greek ruins from those built in the second century AD by the Romans on the same site. Then of course they have to contend with destruction by fire, and raids by pirates who stole the best bits. It's astonishing to me they have any idea at all what went on. Meanwhile, a town like Momenvasia (of which more in a later blog), went through even more transformations for archaeologists to untangle. It was built when the Peloponnese was part of the Byzantine empire (Christians from what is now Turkey) around the 6th century AD, then went through the hands of the French, the Venetians, the Ottomans (Muslim Turks), the Venetians again, back to the Ottomans, and finally the modern day Greeks. Trying to restore buildings that have been through so many different civilisations must be a total nightmare.